I got the idea to write this post because I was talking to Jim a couple of weeks ago and he didn’t believe me that hobbits were real. I tried to prove to him that hobbits were real by googling Homo floresiensis, but he didn’t seem that interested. H. floresiensis was a species of mini-hominids that lived on the Indonesian island of Flores from about 190,000 to 50,000 years ago. The Tolkien Estate would prefer that we not call them hobbits. Which is fair, since they probably looked like this. In 2003, the remains of a female individual, who would have been about 3’7” or 1.1 meters tall, were discovered in a limestone cave known as Liang Bua. The remains were discovered by a group of Australian and Indonesian scientists who were looking for evidence of Homo sapiens’ migration from Asia to Australia. Instead, they discovered what is now widely believed to be a whole new species of human. The discovery of this almost-complete skeleton was shortly followed by the discovery of the remains of seven other individuals, as well as the discovery of a number of small, primitive stone implements. The scientists also uncovered the bones of an extinct elephant, Stegodon florensis insularis, a species descended from the full-sized S. florensis florensis which experienced island dwarfing, a phenomenon in which a large species confined to an island or other isolated area evolves to a smaller size over time. So, were these tiny humans originally regular-sized humans who shrank over generations of life on Flores? Perhaps; the Wikipedia page on insular dwarfism lists Flores Man as an example of the phenomenon in primates, putting it in such illustrious company as the Nosy Hara dwarf lemur (named after an island called Nosy Hara, not after a guy called Hara who couldn’t mind his own business) and the early inhabitants of the island nation of Palau, who may or may not have been unusually small members of the species Homo sapiens, depending on who you ask. It’s possible that H. floresiensis is not a discrete species at all, but is instead a smaller version of Homo sapiens. 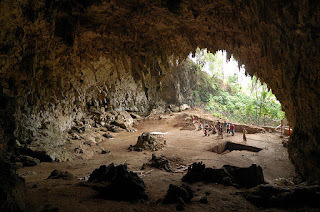 Some scientists point to the modern-day existence of a light-skinned pygmy people in the Flores village of Rampasasa as proof that the specimens labeled H. floresiensis could in fact be early examples of this same modern tribe. Others argue that the small individuals found in the cave are not early examples of modern pygmy peoples, but a separate species. H. floresiensis is a full foot smaller than the average height of most modern pygmy peoples, and possesses other physical features that are very different from those of modern humans. The structure of the arms, shoulders, teeth, and especially the wrists are such that scientists think this hominid was more closely related to great apes and early hominids, like Australopithecus, than to modern humans or even earlier human species like Homo neanderthalensis or Homo erectus. 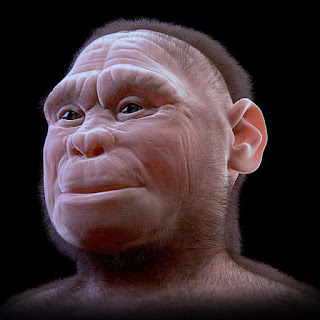 Some scientists believe that H. floresiensis evolved from the same hominid ancestor as Homo habilis, making it an older species than Homo erectus; if this theory was correct, it would mean that Homo erectus was not the first human species to leave Africa. However, others believe that H. floresiensis was descended from Homo erectus. Still others believe that the unfortunate individuals found in the cave were normal, garden-variety Homo sapiens who had the misfortune to live a long time ago and suffer from debilitating illnesses like Down’s syndrome, microcephaly, Laron syndrome, or endemic cretinism, a condition in which one is born without a thyroid. Researchers including Dean Falk argue that, despite having a brain the size of an orange, H. floresiensis possessed cognitive powers sufficient to make and use the stone tools found in the cave (which are technologically on par with the more sophisticated tools made by Homo sapiens of the Upper Paleolithic or Late Stone Age), to use fire, and to hunt cooperatively to bring down admittedly small elephants, although I suppose even a cow-sized elephant would be as big as an elephant-sized elephant if you’re three-and-a-half feet tall. Scientists attempted to extract a DNA sample from the teeth of one of the specimens in 2006, which would have presumably settled the debate and revealed the nature of the specimens, but the attempt failed, so the debate rages on.